There are several options to get from Amman to Petra. If you have the time, you can read my entire post and enjoy the photos I snapped. If not, skip to the bottom of the post to get all the condensed information how to get to and from Petra. My travel companions and I decided to take a taxi directly from Queen Alia International Airport to Petra. Actually, I think one of the main reasons why we decided to travel together was because we could split the taxi cost. Haha. ZH and I looked up the prices for the taxis and were thinking of either pre-booking a taxi or winging it and find a taxi when we arrive. We decided to wing it. When we arrived at the airport, I saw a whole line of taxis outside plus a booth. The prices were fixed and it seemed quite reasonable. The two guys got caught up with taking pictures while I arranged for a taxi for us. The only slight problem was that I booked a different accommodation from the guys. They opt to stay in the city center while I chose to stay nearer to Petra itself. So I had to ask the taxi driver to drop the guys off first then bring me to my location. That added to the cost of my transportation. And I didn’t bank on being asked for a tip…and more on top of a tip. But I’ll get to that later. The long flight left ZH, Kevin and I pretty worn out and we rolled into the taxi before settling down for our ride. ZH sat in front with the driver while Kevin and I sat at the back. After a quick stop at a random shop along the road to buy some water and a bit of chit chat in the beginning, the car was in total silence for the next few hours – which was funny because we had all just met for the first time and we didn’t really want to make small talk. We dozed off, took pictures from the windows, I facetime-ed the family (and disturbed the peace in the car for a while) and got to join a birthday party via technology. When we pulled into the town, our excitement sunk in a bit while we kept an eye out for the guys’ hotel. After telling me to drop them a message when I reached my accommodation, the guys disappeared into their hotel and I was left alone. The taxi driver had no idea where my guesthouse/apartment/whateveryoucallit was located and I had to pull out Google Maps and lead him to the house. When we arrived, I paid him 69.50JD and an additional 10JD because he had to drive further out to drop me off. Then he frowned and asked for more. I frowned and pulled out another 10JD and thought I was done. After all, S$40 is quite a lot of extra money. After he fanned out his 90JD, he looked at me and asked for more. At that point, I felt that I was being taken advantaged of and refused to give him a single cent more. I told him no. He immediately gave in and took out my bag from the car. We parted on okay terms. Note: you will NOT just pay 69.50JD. Budget another 10-15JD more. We didn’t need to take a taxi around Petra City Centre – it was small enough to walk around it. Since my guesthouse was about a 15 minute walk from the City Centre, I walked over to meet the guys for an early dinner. The scenic walk along the sidewalk coupled with the cool breeze was only disturbed by the sounds of cars honking as they drove past me. Why did they honk? They were hoping I would take a ride from them to the center. I didn’t. I took lots of pictures on the way down to town since the guys were also doing their own walk around the city and I wasn’t in a rush. When we finally met up, I told them all about the awesome view I saw and we *just* had to a ways walk back so they could take pictures. I never felt more sad about my lost camera – but that story is for another time. Kevin overlooking the route to Petra. After dinner, I bid the guys adieu and promised that I would let them know once I arrive at my guesthouse. The sky was darkening and the temperature dipping. I wrapped my head a little tighter and started walking back slowly. But of course I stopped to take pictures…and some blur selfies. The sky was blue and the lights were out. Cars continued to honk as they passed me but I ignored them and just kept a keen ear out for any weird sounds around me. All was well. The view whilst walking back to my guesthouse. Restaurants were closing and I saw some ladies walking home with their children. This sight calmed my wandering imagination about danger (remember, it was my first night in Jordan and I had no idea how safe it was). I walked behind them and smiled at the kids running along the road. Then I made a turn into the road leading up to the guesthouse and stopped to take a shadow selfie complete with the V sign. Once I got back to my guesthouse, I told the owner that I would wake up at 6:15-30am and have my breakfast before heading down to explore Petra. The guys and I agreed to meet at 6:45am at the entrance. I fell asleep at around 9:30pm and FORGOT TO SET MY ALARM. Crazy right? I remembered to haul the heavy chair to lean against the door but forgot to set my alarm. I slept well and only awoke to my phone vibrating from a Whatsapp call…from ZH. I shot up in my bed and tried to erase any signs of sleep from my voice. I didn’t fool him a bit. I glanced at my watch – 6:55am. I was so dead. Thankfully they were kind enough to wait for me (while they ate their breakfast) near the entrance. I told them that I would meet them in 10 minutes. I rushed out of the room only to see the guesthouse owner sitting at on the kitchen counter waiting for me…to eat my breakfast. I felt so bad! I gobbled a few slices of thin bread with different kinds of spreads, packed some in my ziplock bag and dashed out of the guesthouse…into a shop to buy lunch for our day in Petra. The guys were still leisurely munching on their bread when I breathlessly plopped down on the bench next to them. After catching my breath, we three made our way into Petra. We read online that there is a bus that can take you from your accommodation in Petra (where you are staying) to the Wadi Rum Visitor’s Centre. All you have to do is to ask the hotel concierge/host/guesthouse owner to arrange the pick up for you. Since my guesthouse was on the edge of nowhere (it seemed) I was the first passenger. If I’m not wrong, the bus came at 6+am. You just need to pay 7JD and it’ll bring you all the way to Wadi Rum. We asked our Wadi Rum guide (the one which I had a nightmare about) to help us book a taxi from the Wadi Rum Visitor’s Centre to Aqaba. It cost us 20JD. From there, they guys took the JETT bus to Amman. See the schedule here. The journey took them 4 hours and cost them about 8JD. The bus station in Aqaba. If you read the entire post, congrats. You read through my ramble. But if you didn’t, here’s the condensed version of how to get to and from Petra. Take a taxi and be prepared to spend about 80JD. Rent a car and drive. I was all for this option but ZH wasn’t too keen on driving after a long flight. Take the JETT bus and pay 10JD. But it leaves early at 6:30am so you might need to stay overnight in Petra. I’ll touch on the accommodations in the next post. You will also need to factor in transport from the airport to Amman. More info here. To Amman: take the JETT bus which leaves at 5pm from Petra. 10JD. 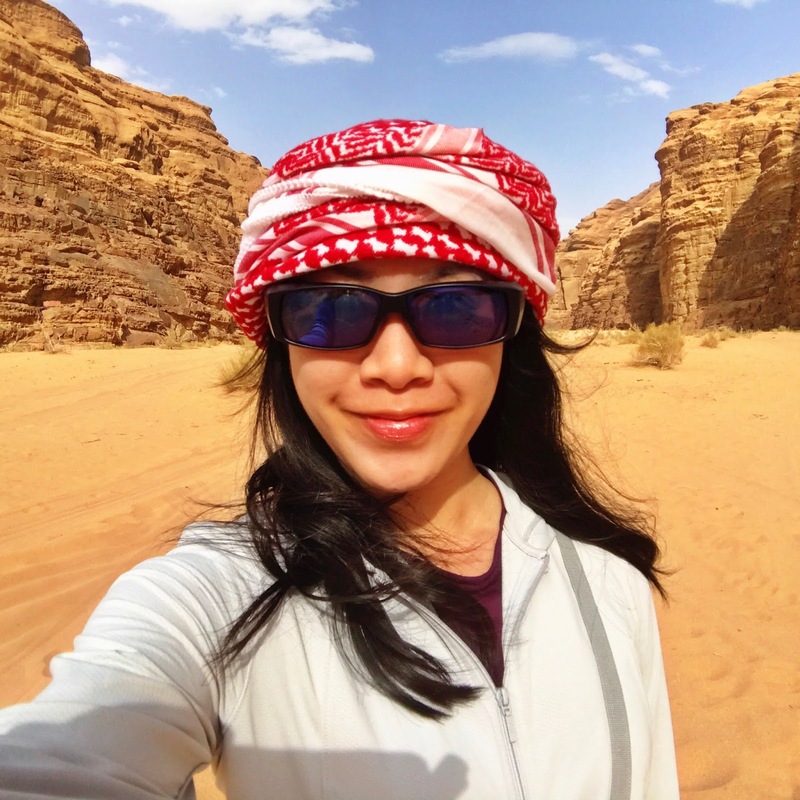 To Wadi Rum: ask your hotel front desk or guesthouse owner to arrange the 7JD bus for you. Be prepared to leave early from Petra though. There is no direct bus from Wadi Rum to Aqaba to Amman. You either have to go back to Petra (on the 7JD bus) then move on from there. It’s easier to go to Aqaba in a taxi for around 20JD then plan your trip back to Amman. Just take note that the journey from Wadi Rum to Aqaba will include a security check before you can even enter Aqaba since it is a tax free zone. We had to get out of the taxi, go into a small office and hand over our passports for a quick check. What was my takeaway from this whole (transportation) journey? If you want to make full use of your time in Jordan, take a cab or rent a car but be prepared to spend…unless you’re in a group and can the split cost. If you have the luxury of time, take the buses. hi! i'm v. this space on the web is where i share my travel stories (and other random stuff).